Welcome to this year’s Local Consumer Review Survey! 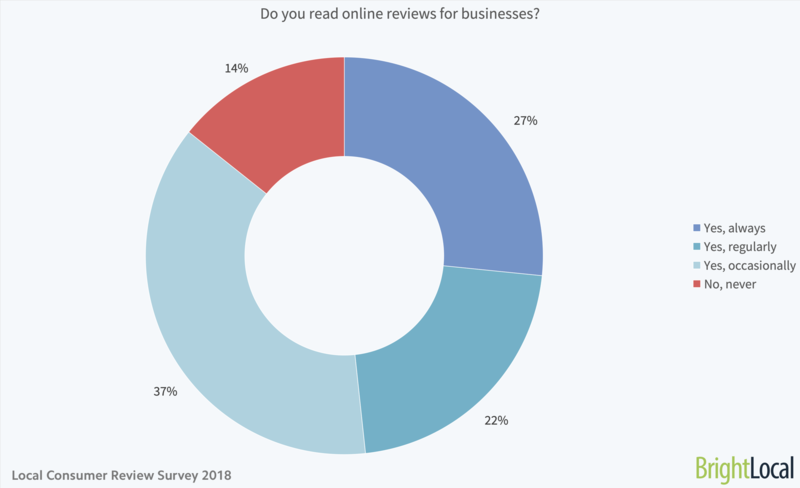 We’ve compiled the latest trends in online business reviews, giving you all the statistics you need to develop your online reputation management strategy for local businesses in 2019. 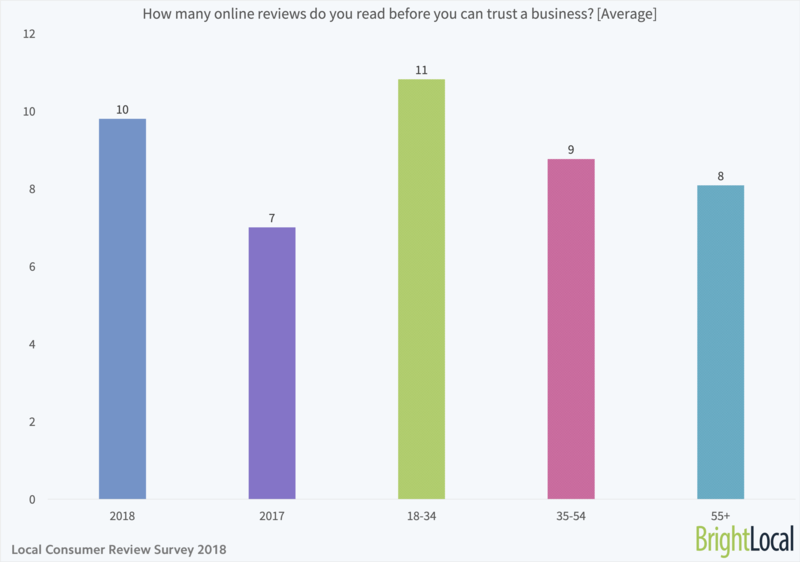 When we first released this report way back in 2010, we could never have imagined how important online reviews would become to businesses – to now being one of the fastest-growing local ranking factors. This year, the main themes uncovered in the report highlight consumers’ changing behavior when reading reviews, an increased frequency of review searches, and the true worth of businesses responding to their reviews. For the first time, we’ve delved into trends among different age categories, to find out how the different generations use and value local business reviews. Because of this, we’ve slightly altered the proportion of each age group to ensure this is closely tied to the US population. You can find more on the age breakdowns in the methodology. 1. 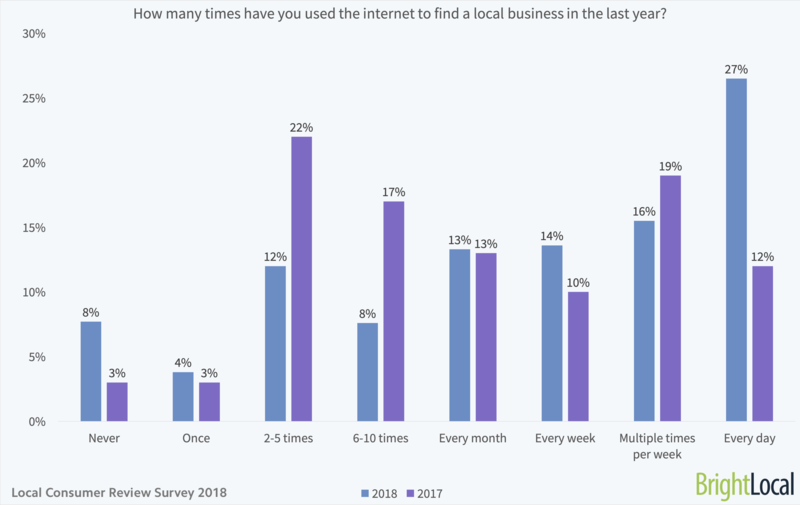 How many times have you used the internet to find a local business in the last year? 2. Do you read online reviews for businesses? 3. Which devices have you used to read consumer reviews in the last year? 4. 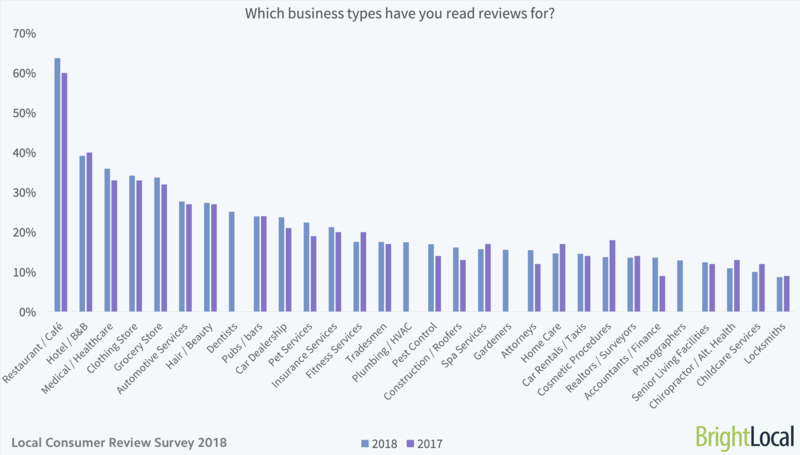 Which business types have you read online reviews for? 5. What is your typical next step after you read a positive review? 6. How do online customer reviews influence your decision to actually use a local business? 7. Do you trust online reviews as much as personal recommendations? 8. Have you read a fake review in the past year? 9. When judging a local business on reviews, what do you pay attention to? 10. What’s the minimum star rating a business must have for you to use them? 11. How many reviews does a business need before you believe its Average Star Rating? 12. How many online reviews do you read before you can trust a business? 13. How recent does an online review need to be to impact your decision? 14. When searching for a local business, do you read businesses’ responses to their reviews? 15. Have you ever left a local business an online review? 16. Have you ever been asked to leave a review for a business? How many times have you used the internet to find a local business in the last year? Substantially more consumers searched daily, weekly and monthly for local businesses this year. After the gradual increases seen over the last few years, it’s fascinating to see this huge leap. This year, we chose to focus on the differences in the use of reviews by consumers aged 18-34s, 35-54s, and 55s. Subsequently, we’ve slightly increased the proportion of over 55s to suit the US population. 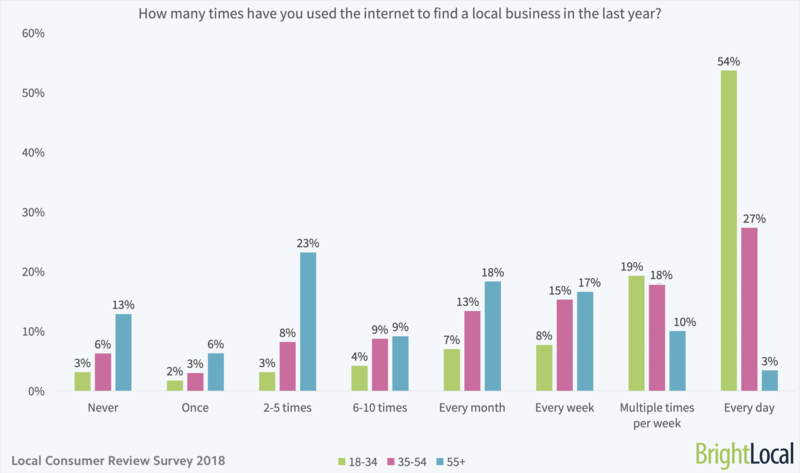 Generally, the over 55s in the study tended to be less familiar with searching the internet for local businesses, as well as using online reviews. This is the likely cause of the slightly higher proportion of consumers who didn’t search for businesses at all. At the other end of the scale, more than half of 18-34-year-olds search for local businesses every day, while 81% check every week. Do you read online reviews for businesses? The vast majority of consumers (86%) read reviews for local businesses. While there was a slight growth in those surveyed who’d never read a review, this could be a quirk of this sample. We’ll be looking forward to comparing this next year, to see if this trend continues. When looking at the different age splits, there’s a clear trend between the frequency of consumers reading reviews, and their age group. Just 6% of people aged 55+ ‘always’ read consumer reviews, with a further 69% regularly or occasionally reading them. Only 5% of people aged 18-34 never read reviews, with 50% always turning to them. Which devices have you used to read consumer reviews in the last year? 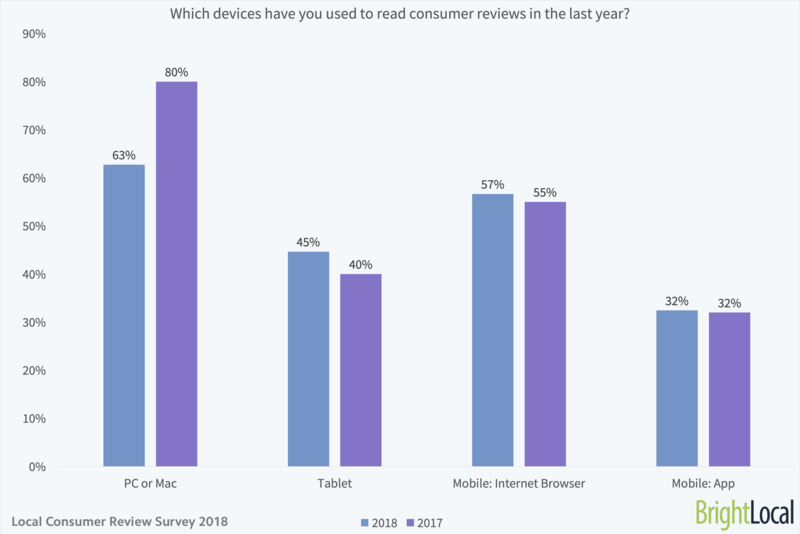 One key story this year is the dip in consumers reading reviews on computers. Could review reading be being reserved for portable devices? When looking across age groups, there are plenty of variations. 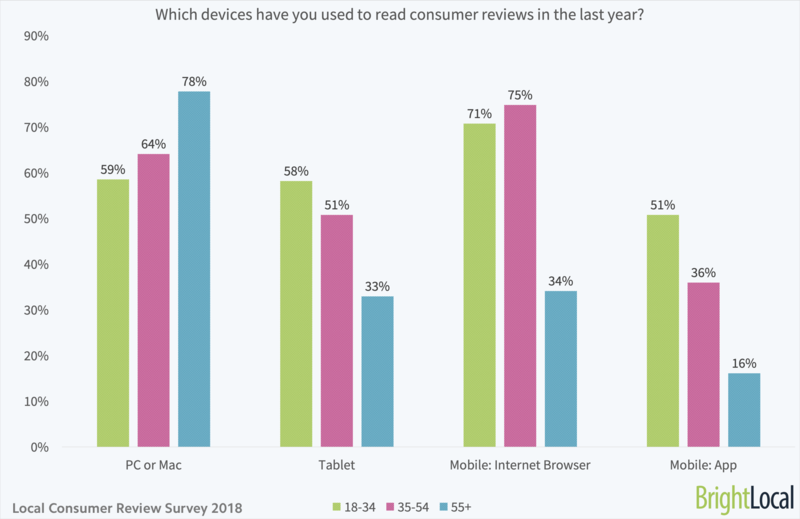 Over 55s are far more likely to use computers to read reviews than their younger counterparts, while 35-54-year-olds opt for mobile browsers. 18-34-year-olds are far more likely to read on apps. Overall, there wasn’t a lot of change in the proportion of consumers reading reviews on mobile this year. Tablets, on the other hand, have become slightly more important. Which business types have you read online reviews for? For the sixth year running, consumers are most likely to read reviews for restaurants and cafés. In fact, even more consumers read restaurant reviews this year than they did the year before. The above table shows the proportion of review-readers in each age group by the types of reviews they have read. It does not include people who do not read reviews. Interestingly, the majority of review-reading consumers aged 55+ have looked at restaurants and cafés. Of course, these are very traditional types of reviews, with plenty of industry-specific sites to choose from. What is your typical next step after you read a positive review? Last year, we saw a significant dip in consumers heading to local business websites after reading positive reviews (54% in 2016, down to 37%). In 2018, this bounced right back up, with half of the consumers visiting websites as their first step. Interestingly, this seems to be lowering the proportion of consumers who continue reading after seeing a positive review. This year, 78% of consumers’ typical next steps are straight to the business, compared to 64% last year. Are positive reviews now the deciding factor, meaning consumers need no further convincing to get in touch? Across the ages, there does seem to be some key differences in consumers’ actions. 69% of over 55s head to the website first – clearly, websites aren’t dead yet! The younger group are more likely to visit or contact the business than their older counterparts. How do online customer reviews influence your decision to actually use a local business? Consumers were able to choose up to two options. 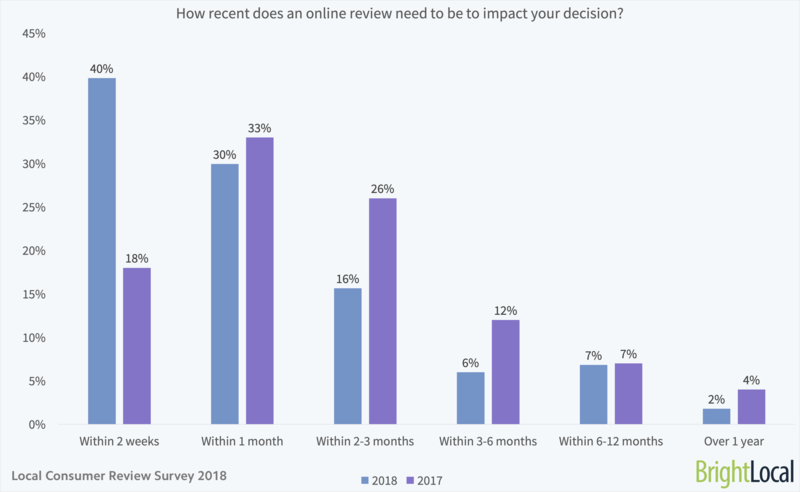 There has been very little change over the last year on how reviews influence consumers’ decisions – with a significant proportion being influenced by reviews. Do you trust online reviews as much as personal recommendations? 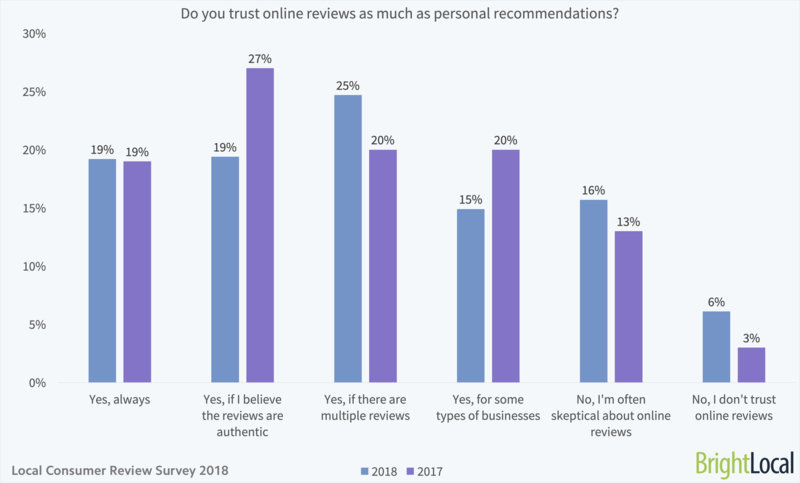 Over the last year, there was a slight decline in how many consumers trust online reviews as much as personal recommendations. Could this be a reaction to fake reviews in the news damaging consumer trust in online reviews? 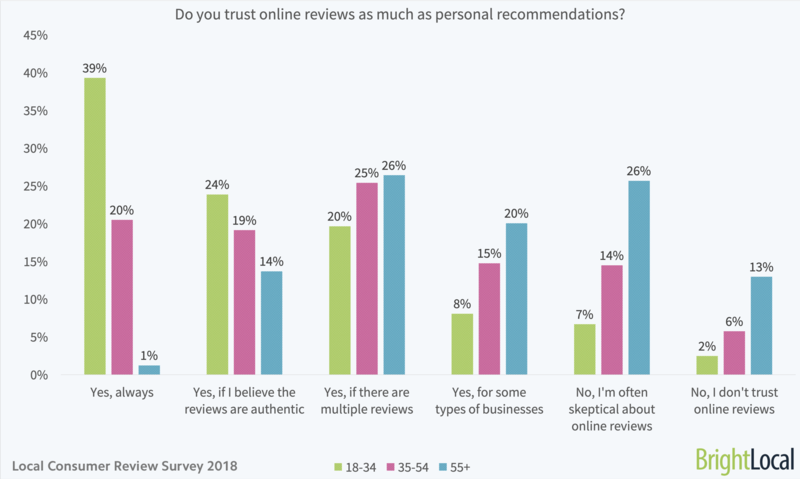 Interestingly, there was a growth in the proportion of consumers requiring multiple online reviews before feeling able to trust a business. In our recent Google Reviews Study, we found that the average local business has 39 reviews on Google. However, businesses ranking in the top 3 search positions have 47 reviews. The more reviews, the easier it is for consumers and search engines alike to trust that review ratings are accurate. Have you read a fake review in the past year? In 2018, there was a dip in the proportion of consumers reading fake reviews – from 79% in 2017, to 74% today. Rather than this suggesting fake reviews are declining, it could indicate that fakers are getting better at hiding them. As is the trend throughout this report, there are contrasts between the 18-34 category and the 55+. 57% of the youngest group identified lots of fake reviews, with a further 32% saying they’d read at least one. Those aged 55+ were less likely to have spotted multiple fake reviews. To find out more on the impact of fake reviews, check out Ben Fisher’s great blog. When judging a local business on reviews, what do you pay attention to? Consumers were allowed to select a maximum of two answers. For the fourth year running, a business’s average star rating is the most important review factor. Interestingly, our recent research found that local businesses have an average of 4.42 stars on Google – ranging from senior living businesses with 4.05 stars, to photography businesses with 4.84. Quantity of reviews continues to grow in importance, with more and more consumers naming this as a top method of judgment. The recency of a review has also become more important for consumers, as you’ll see below. What’s the minimum star rating a business must have for you to use them? Over the last year, the proportion of consumers expecting a high star rating has shot up. Now, 57% of consumers won’t use a business with fewer than 4 stars. While many businesses surpass this on Google, those that fall below this average star rating on any platform could risk deterring a significant number of potential customers. There are hundreds of review sites out there, with many consumers looking beyond Google, Facebook and Yelp to choose a business near them. Again, we saw some interesting trends here across age groups. 61% of over 55s won’t use businesses with under 4 stars. 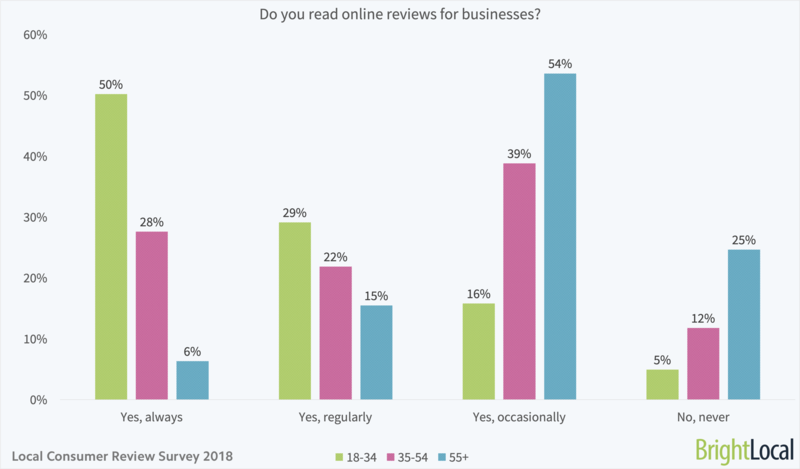 While the proportion of shoppers in this age group are less inclined to read local business reviews, those that do are more likely to expect good results. In fact, the youngest group were the most likely to accept a 1 or 2-star review. Let us know why you think this might be in the comments. How many reviews does a business need before you believe its Average Star Rating? 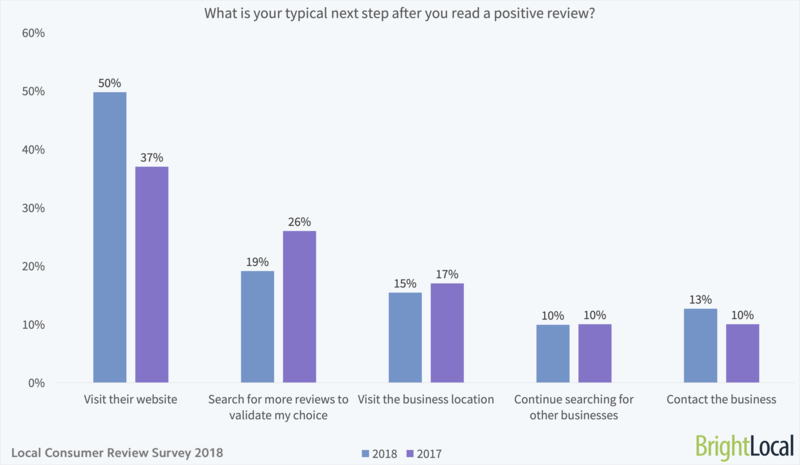 The latest Local Search Ranking Factors survey reported increased importance in review signals, with the quantity of native Google reviews being the third biggest increase in focus for experts. Quantity is clearly important for consumers (as well as Google!) On average, consumers want businesses to have 40 reviews before they trust the overall star rating is representative. This is up 6 reviews from last year. 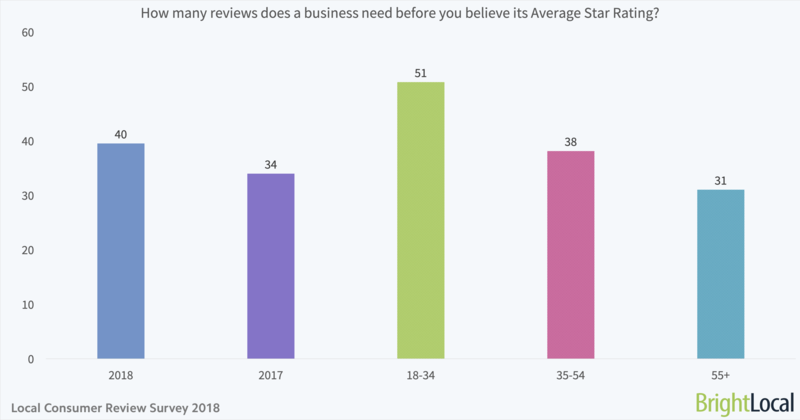 The group aged 18-34 require the highest number of reviews – this age group evidently expect businesses to take reviews as seriously as they do. How many online reviews do you read before you can trust a business? While consumers may expect a high number of reviews before feeling able to trust a business, it’s unlikely many consumers have the time to read hundreds of peers’ experiences before choosing where to get dinner. Yet, there’s been a marked growth in the number of reviews the average consumer reads. Now, 70% of consumers read 4 or more reviews before trusting a business. Whether you want to impress local customers, or to demonstrate your worth to Google, it’s incredibly important to build a reputation management strategy focused on gathering a steady stream of new online reviews. How recent does an online review need to be to impact your decision? In the last year, there’s been a huge increase in consumers expecting reviews to be new. The proportion of consumers who are solely impacted by reviews written within the past two weeks has more than doubled. 85% of consumers believe reviews older than 3 months aren’t relevant – up from 77% in 2017. Local businesses need to keep fresh reviews coming in if they are to impress potential customers. Remember, if you don’t ask, you don’t get. When searching for a local business, do you read businesses’ responses to their reviews? For the first time, we’ve added a question on replies to reviews to find out if these are valued by consumers. We found that the vast majority of consumers read business owners’ responses to reviews. Whether they’re positive, negative, or even fake, it’s absolutely critical that businesses stay on top of their reviews, and respond professionally, politely – and pronto! Monitoring reviews across multiple platforms take time, but it’s critical to monitor these so you’re aware of everything that’s being said about the business. Negative feedback deters many consumers from choosing a business, so replying to these give readers the context needed to understand poor feedback. Responding to reviews gives you the chance to get your story across, as well as to show potential customers what you’re really like as a business. Have you ever left a local business an online review? What percentage of customers leave reviews? 59% of consumers have written reviews for local businesses, with a further 27% saying they were open-minded to leaving reviews. Just 14% of customers would never leave an online review. The youngest group are far more inclined to leave online reviews, with 96% being open-minded about feeding back to businesses. These digital natives may well see leaving reviews as commonplace, rather than something done for standout service. Over 55s are far less likely to leave reviews, with 22% saying they ‘never’ will. It’s critical for local businesses to engage every type of customer to get a truly representative idea of how the business is performing. This year, a higher proportion of respondents told us they hadn’t left local business reviews. While this could be a quirk of this dataset, there could also be other reasons. Trust in reviews has been damaged, with the prevalence of fake reviews hammering home that you can’t always believe what you read on the internet. We’ll be sure to watch this trend for the 2019 report. Have you ever been asked to leave a review for a business? This is another question where we’ve seen an unexpected drop this year. 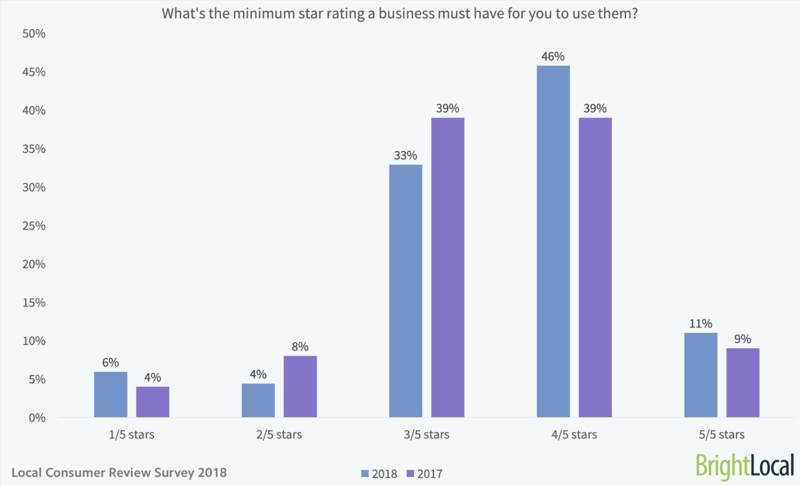 While this could be down to the individual experiences of this year’s respondents, it may also be due to a growing reluctance among businesses to ask for reviews. Asking for Yelp reviews is a big no-no, and can lead to reviews being discounted by the platform’s algorithm. Likewise, in 2018 Google cracked down on review gating. With two of the major platforms adding rules and complexities to review management, it could be that some businesses are feeling confused about what they can and can’t do. The dramatic difference across age groups of the consumers who’ve been asked to leave reviews was particularly interesting. Only 50% of over 55s have been asked to leave reviews, with 29% going on to do so. 18-34-year-olds were far more likely to have been asked, and also, far more likely to leave a review if asked to. But this is no reason to narrow your reputation management strategy to only focus on this millennial and Gen Z segment. Every review is equal – and by asking every customer to leave a review, you’re far more likely to grow the number of reviews quickly and naturally. 70% of consumers that have been asked to leave reviews went on to do so. 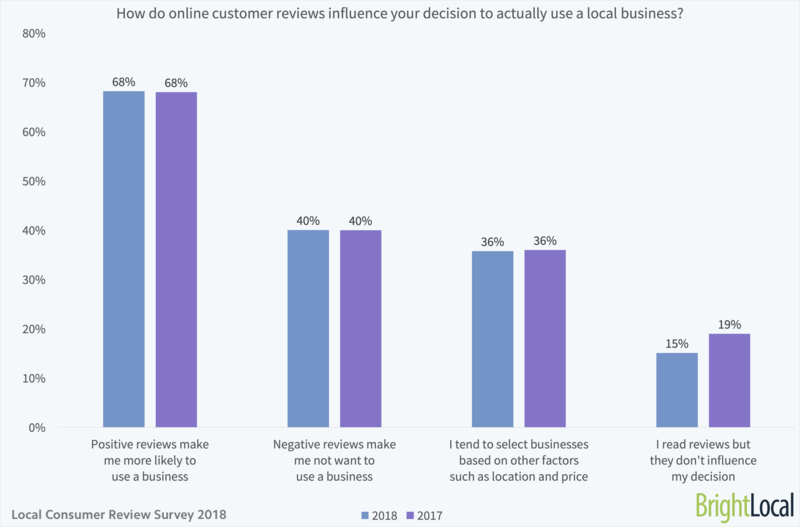 This year’s Local Consumer Review Survey follows on from 2017’s, exploring trends in online reviews for local businesses over the past year. It includes new and modified questions to fit into the key SEO and local business reviews agenda of 2018. The statistics and findings are solely concerned with reviews for local businesses (on sites such as Google, Facebook, TripAdvisor, Yelp etc), and not general product reviews (such as on Amazon). When analyzing data on those who have read consumer reviews, we removed respondents who don’t read reviews to give a more accurate reading. Averages for statistics in Q11 and Q12 are based on the midpoints of data bandings. For any questions about the report, or to speak with a member of the BrightLocal team, please contact content@brightlocal.com, or leave a comment below. Publishers are welcome to use charts and online reviews statistics crediting BrightLocal and linking to the report. Thank you for reading the 2018 Local Consumer Review Survey! If you have any questions or thoughts on what these statistics mean for local businesses, please leave a comment below.